Citrus County Model Homes, New Home Construction - Wheeler Construction Inc. 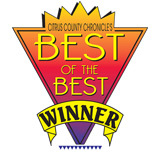 Winner of the Citrus County Chronicle's "Best of the Best" Home Builder Award many years over, Wheeler Construction offers many awarding-winning new home designs. Past awards include Best Kitchen, Best Bath, Best Overall Effect, Best Floor Plan, and Most Innovative & Creative Design. Choose from one of the many award winning home models below or we can design a unique Custom Home design, just for you. Building site & water by owner.